Allow buyers to understand the features & detailing in each product, giving them confidence to purchase. Optimize the look of your zoomed image. Choose from zoom, magnify & preview. We highly recommend the magnifier design. It looks awesome. Explore images in detail with a round magnifying glass. Swipe images left/right to instantly browse images on touchscreens. Convey large amounts of information with YouTube & Vimeo product videos. Swift image previews at a specified size - perfect for a fast glimpse on category pages. Improve the experience by picking different customizations for handheld devices. Subtle refinements to speed, transitions, sensitivity, buttons, hints, fonts and icons for a sophisticated user experience. Style it to suit your site with fully customizable Magic Zoom Settings page. Enable Magic Zoom throughout your store: Product details page; Category page; Search page; Featured products; Viewed products block; Manufacturers page + 8 other sections. Thanks to responsive design, images automatically scale up/down to fit users screen. Alternatively, download Magic Zoom Plus. It does all of the above, plus it enlarges the image to full screen when you click it. Even better for iPad and iPhone! Compatible with with 'Layered navigation block' module. Supports Product Attribute functionality on product page. 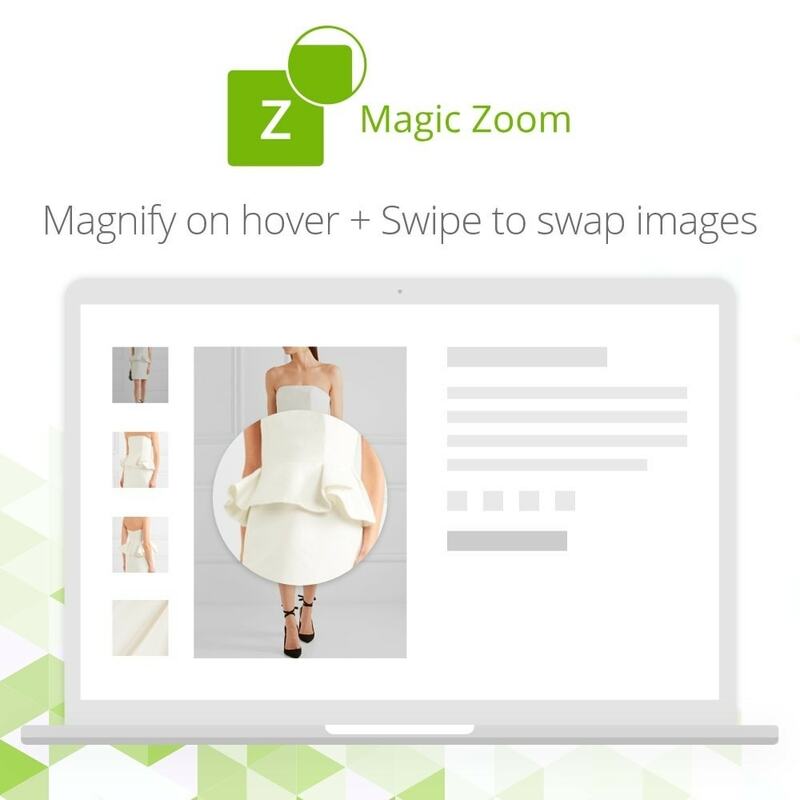 Magic Zoom supports iOS (iPad/iPhone) and Android devices – so customers can shop from any device. Intricate details of each product as if the customer was holding it in their hand. Zoom on any size, color or style – Magic Zoom is compatible with Product Attributes out-of-the-box. Watch YouTube & Vimeo product videos for an immersive experience. Give customers a great close up with impressive images. Upload large images and PrestaShop will resize the images throughout your store. We recommend 1000+ pixels width in size for an impressive zoom. Admin > Modules and Services > Modules and Services > Magic Zoom > Configure. Click 'Product page' tab > 'Zoom mode' section > 'Zoom mode' option > Click 'edit' > Select 'magnifier' > Click 'Save settings'. The ultimate way to show product images - zoom images AND 360 spinning images. Buy Magic 360 at just EUR 89.99 and let your customers see every angle of your product images. Magic 360 + Magic Zoom are the perfect combination to increase conversions on your website. Download the PrestaShop module for Magic Zoom. Either upload it via your PrestaShop admin area. Or unzip the file on your computer and FTP the magiczoom folder to the /modules/ directory of your store, keeping the file and folder structure intact. Activate the module via the Modules menu Modules > Other Modules > Install. Magic Zoom is now installed! Customize Magic Zoom as you wish. Magic Zoom can be enabled on any page or section you choose. 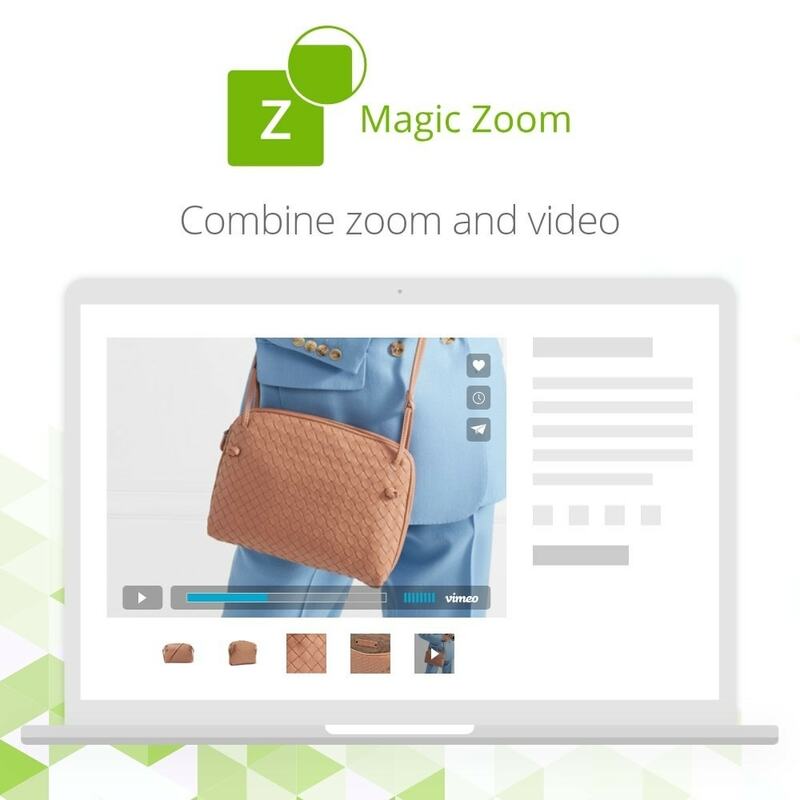 Enable Magic Zoom throughout your PrestaShop e-commerce site!